Fifty free worksheets with a total of 600 questions. I've put together a collection of Equivalent Fractions Worksheets ready so kids can get lots of practice with equivalent fractions. 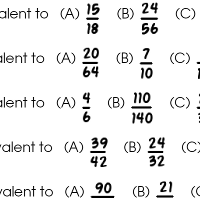 After all, it's not always enough to have equivalent fractions explained or to play an equivalent fractions quiz game. Level 5 Equivalent Fractions Worksheet 1, 2, 3, 4, 5, 6, 7, 8, 9 or 10. Alternatively, if you like your equivalent fractions questions in big doses, you can download all the worksheets for level 1, level 2, level 3, level 4 or level 5. Enjoy! And don't forget to check out the other Fractions Worksheets on this site.